Modern, casual and lively tapas restaurant, serving Bombay-style street food. Tuk Tuk has been serving tapas-style Indian street food in Bruntsfield for seven years. Its slick format does feel a little chain-like, though so far has spawned just one off-shoot in Glasgow. It attracts local families, theatregoers from the King’s opposite and students who come armed with clinking bags from the Co-op next-door. 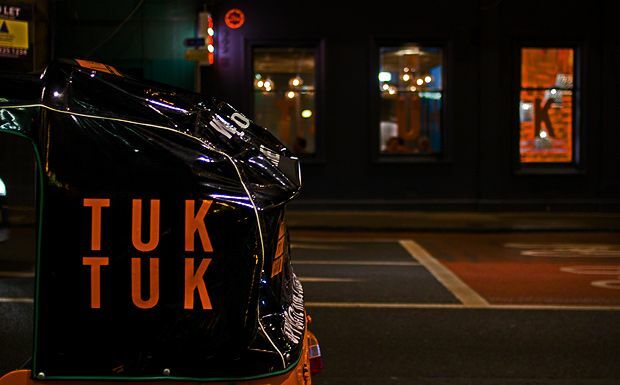 A generous BYOB policy (just £1 per head for recycling) is part of the appeal, and allows Tuk Tuk to focus on the food. Poppadums and some sweet tangy chutneys make a good start, but the roadside plates to follow include slightly stodgy Bengali fishcakes and dhal kachori. A pair of lamb chops from the grill are tender yet fiery thanks to a spicy overnight marinade, while the railway station lamb curry on its bed of spinach is deservedly popular. The work canteen décor is fun, but be warned, it can get a bit noisy.